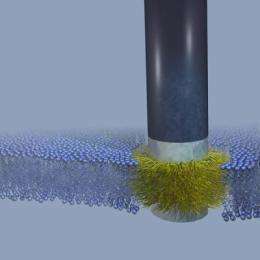 A nanometer-scale probe designed to slip into a cell wall and fuse with it could offer researchers a portal for extended eavesdropping on the inner electrical activity of individual cells. Everything from signals generated as cells communicate with each other to "digestive rumblings" as cells react to medication could be monitored for up to a week, say Stanford engineers. Current methods of probing a cell are so destructive they usually only allow a few hours of observation before the cell dies. The researchers are the first to implant an inorganic device into a cell wall without damaging it. The key design feature of the probe is that it mimics natural gateways in the cell membrane, said Nick Melosh, an assistant professor of materials science and engineering in whose lab the research was done. With modification, the probe might serve as a conduit for inserting medication into a cell's heavily defended interior, he said. It might also provide an improved method of attaching neural prosthetics, such as artificial arms that are controlled by pectoral muscles, or deep brain implants used for treating depression. The 600-nanometer-long, metal-coated silicon probe has integrated so smoothly into membranes in the laboratory, the researchers have christened it the "stealth" probe. "The probes fuse into the membranes spontaneously and form good, strong junctions there," Melosh said. The attachment is so strong, he said, "We cannot pull them out. The membrane will just keep deforming rather than let go of the probes." Melosh and Benjamin Almquist, a graduate student in materials science and engineering, are coauthors of a paper describing the research published March 30 in Proceedings of the National Academy of Sciences. The paper is available online. Up to now, poking a hole in a cell membrane has largely relied on brute force, Melosh said. "We can basically rip holes in the cells using suction, we can use high voltage to puncture holes in their membranes, both of which are fairly destructive," he said. "Many of the cells don't survive." That limits the duration of any observations, particularly electrical measurements of cell function. The key to the probe's easy insertion - and the membrane's desire to retain it - is that Melosh and Almquist based its design on a type of protein naturally found in cell walls that acts as a gatekeeper, controlling which molecules are allowed in or out. A cell membrane is essentially a walled fortress. Within the wall itself is a water-repellant, or hydrophobic, zone. Since almost all molecules in a living being are water soluble, the hydrophobic region acts as a barrier to keep the molecules from slipping through the cell wall. The only way in or out is via the specialized proteins that form bridges across the membrane. Those "transmembrane" protein gateways match the architecture of the membrane, with a hydrophobic center section bounded by two water soluble, or hydrophilic, layers. "What we have done is make an inorganic version of one of those membrane proteins, which sits in the membrane without disrupting it," Melosh said. "Now we can envision using it for doing our own gate keeping." To build their probe, Melosh and Almquist appropriated nanofabrication methods from the semiconductor industry to make tiny silicon posts, the tips of which they coated with three thin layers of metal - a layer of gold between two of chromium - to match the sandwich structure of the membrane. They then coated the gold band with carbon molecules to render it hydrophobic; the chromium bands are naturally hydrophilic. "Getting that hydrophobic band just a few nanometers in thickness was an incredible technical challenge," Melosh said. Applying such a thin layer to the tip of a probe only 200 nanometers in diameter was impossible using existing methods, so he and Almquist devised a new technique using metal deposition to create the thin band that was needed. That carefully applied metal coating on the stealth probe could give researchers electrical access to the inside of a cell, where they might monitor the electrical impulses generated by various cellular activities, Melosh said. That, combined with the probe's stability in the membrane, could be a huge asset to studies of certain electrically excitable cells such as neurons, which send signals throughout the brain, spinal cord and other nerves. A device called a "patch clamp" can be used to monitor those sorts of electrical signals among cells now, Melosh said, but in its current form, it is comparatively crude. "You come in with it, touch it to the cell surface, apply suction and tear a hole in the cell to give you access," he said. "However, it is a fairly slow procedure that has to be done one cell at a time, and it kills the cell within an hour or so." "If the stealth probe will give us a long-term patch clamp, we'll really be able to get the ability to watch these networks over long periods of time, perhaps up to a week," he said. "Ideally, what you'd like to be able to do is have an access port through the cell membrane that you can put things in or take things out, measure electrical currents … basically full control," said Melosh. "That's really what we've shown - this is a platform upon which you can start building those kinds of devices." The next step is to demonstrate the functionality of the probe in living cells. Almquist and Melosh are now working with human red blood cells and cervical cancer cells, as well as ovary cells from a species of hamster.